Gov. Jay Inslee warns that repealing Obamacare without a replacement ready to go would be a disaster for Washington residents. Yesterday, with the inauguration of President Donald J. Trump looming, Gov. 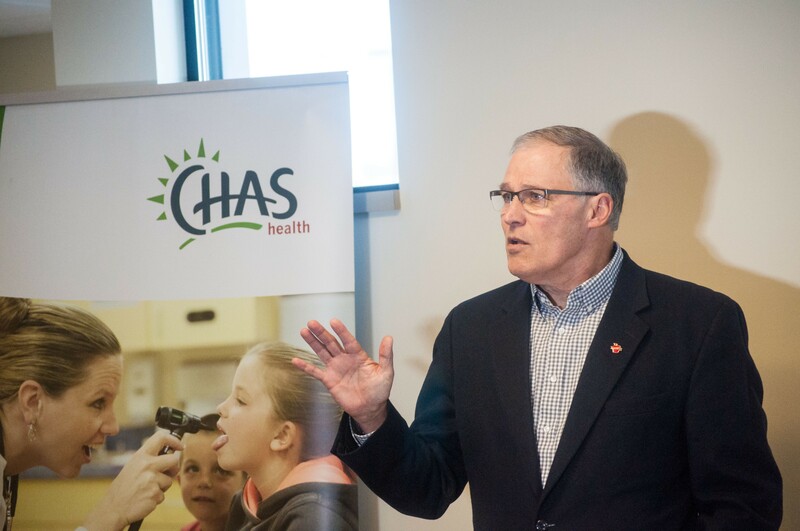 Jay Inslee dropped by a Community Health Association of Spokane clinic to deliver an appeal for Republicans to be cautious in tinkering with the Affordable Care Act — or Obamacare, as it's better known. He also urged Washington residents to look very carefully at the words Republicans have been using — like "access to" and "same day" — about their own health care reform proposals. "I'm here on behalf of 750,000 Washingtonians who have health care for one reason. And that's because we have the Affordable Care Act that protects them and their families," Inslee said. "Protects their life and protects their health. We are determined not to allow the health care to be threatened by the repeal of the Affordable Care Act without a replacement on the same day." This week, we have a piece on how social services agencies are worried about the impact of Trump's and the GOP's agenda. In particular, they're worried about proposed changes to Obama's health care reform mandate. Inslee echoed those concerns. "It is simply not right, it is morally indefensible, to take away a person's health care and not replace it on the same day," Inslee says. "People who have cancer deserve treatment every single day. They should not be put in a place of anxiety and worry to figure out if they have health care." That's not to say that Inslee couldn't envision ways that the health care system could be better. "We understand there could be many views on how to improve health care reform as we know it today," he says. "We ought to be open to ideas on how to improve the Affordable Care Act. If these improvements are made, they need to be made on the same day as the repeal to the existing infrastructure." Still, he says he's worried about the sorts of phrases he's beginning to hear. "There is language I have heard used from Congress that should cause us great worry. I can hear some members of Congress say, 'Not to worry, we're going to provide people access to care.'" Paul Ryan recently used the phrase "universal access" when describing the proposed still-theoretical GOP replacement plan. "That sounds pretty good, right? 'Access,'" Inslee says. "But it doesn't mean health care. It doesn't mean guaranteed health care. It doesn't mean you'll have a way to provide or pay for access to health care. I have access to buy a $10 million house right now. I got access to buy it. But I don't have the $10 million." Inslee calls these sort of lawyerly word games "sophistry." "We've got to have the full-meal-deal which is real health care and a real guarantee for people — 750,000 people," Inslee says. He also identifies another phrase to be skeptical of. "I've heard people in Congress, say, 'Well, we're not going to cut you off that day,'" Inslee says. "That sounds not-too-bad." It's a phrase U.S. Rep. Cathy McMorris Rodgers used on Twitter last week, writing: "Those who currently receive coverage under Obamacare won’t lose that coverage the day after repeal is signed into law." But Inslee spots a loophole in that language. "Look, if they tell you they're going to cut you off a year from now, you're still at great risk," Inslee says. "We know one thing about the U.S. Congress: We shouldn't be confident that it's going to succeed." Bob Crittenden, Inslee's special assistant for health reform, says that Inslee is currently relying on rhetoric — not any particular legislation or executive action — to try to prevent any reckless repeal of the Affordable Care Act. "He has the bully pulpit and has a lot of influence here," Crittenden says. He says Inslee is hoping that McMorris Rodgers' constituents will flood her with messages to ensure that the health-care law is not repealed without a replacement in place that continues to cover as many people and protect those with preexisting conditions. In the past Washington state has tried to pull off something a lot like Obamacare, only to have voters revolt against the higher taxes that resulted. Republicans seized control of the government in 1995, hollowed out the mandate that everyone buy health insurance, and watched the system death-spiral into disaster. Financially, replicating Obamacare in Washington state would be infeasible, Crittenden says. If Republicans repeal the tax cuts that pay for Obamacare through the budget reconciliation process, Crittenden says, it would mean $6 billion in federal funds lost for Washington each biennium. To put that in perspective, you know the education funding mandate that the legislature has failed to solve for years? $6 billion is about twice that. "Going to $6 billion would be impossible," Crittenden says. But if it's tax money either way, does it matter if the money is coming from the federal government or the state? It does, Crittenden argues. Washington state, unlike the federal government, relies most heavily on the sales tax, which punishes low-income people the hardest.